Mark Twain, the famous to everybody from the very childhood author of the book about adventures of Tom Sawyer and Huckleberry Finn, is actually an author of the novel “Westwards”. This book describes how the entire families move from the developed lands of the East to the wild places of the West, looking for a better life. This story is somehow repeated nowadays – thousands of Ukrainians move westwards, chasing higher salaries and better living conditions. In this case the West is not wild though. According to the World Bank data, a fraction of Ukrainian qualified industrial workers exceeded the respective figures of European and Asian countries in 2013 (87.1% comparing to 78% of industrial workers in each country). At the same time, incompetence of labor in Ukraine was claimed to be a constraint to business development twice less than in contrasted countries (7.4% comparing to 15.2%). GfK researches show, that a lack of qualified labor (27% of firms) limits business performance even more than a lack of capacities (19% of firms). CEOs of Ukrainian companies clutch their heads – the best employees, who were invested a lot of resources in, and supposed to run the companies in the future, quit and build their careers abroad. It became common for managers to ask business owners to increase allowances of employees, but even these favors do not prevent the smartest and promising people from going to another country. «Every second Ukrainian company (56%) faces the problem of staff selection, particularly due to a high scale of labor emigration», – Ernst & Young states based on their monitoring of Ukrainian labor market, which was launched in 2002 and involved about 200 Ukrainian and international companies from more than 20 industries. Is it possible to stop this outflow of qualified labor? Or could it at least be slowed down by some managerial means? What should compensate for the lower than abroad salaries and an unstable economy? A pessimistic approach to this situation explains that no management style will change the outflow of labor from Ukraine, particularly due to a significant gap in standards of living. Polls conducted by Derzhstat prove a gradual increase in the number of labor emigrants. According to the estimates made by a professor at Kyiv School of Economics Hanna Vakhitova, more than 4 mln Ukrainians together with their families got involved in labor migration. For example, salaries in Poland are 3-6 times higher than in Ukraine, and in German, which is planning to open its labor market, employee’s income is even higher. Considering this, it is hard to believe the outflow of labor from Ukraine will be decreased by a change or improvement in management. Alternatively to the mentioned above points, there exists a research by Glucksberg, described in a book by Daniel Pink «Drive: The Surprising Truth about What Motivates Us», offers another, more optimistic answer to the question of brain drain. The results of this research show that after the satisfaction of essential needs (of individual and his inner circle), the effect of material incentives becomes very limited. So what motivates people then? Glucksberg arrived at the conclusion that the creativity of work and the search for unconventional solutions are motivated by three factors: sense of purpose, professional enhancement, and independence. The sense of purpose is understanding and perception of why this work should be done. The professional enhancement is broadening of competences and expertise, cooperation with public opinion leaders. Finally, independence is an opportunity to complete tasks where it is convenient and timely (comfortable to meet a deadline). Doubtlessly, all the cases of talented people emigration are individual. Nevertheless, the cornerstone factors are very likely to be the same. For the sake of a more targeted description of the situation, let’s focus on the youth aged 25-35, who is involved in managerial processes. The first motivational factor, as Glucksberg concluded, is the sense of purpose. The CEOs quite often complain that developed by them strategies lack proper realization. In our opinion, middle-tier managers do not fail the strategy, they are mostly unfamiliar with it. We noticed that the sense of purpose is important not only for a successful implementation of the project. Moreover, it is one the crucial motivation factors for Ukrainian youth, what makes them hungry for ambitious projects such as the establishment of the anti-corruption system of government tenders, education of a new cohort of leaders and introduction of kindergarten children into the critical thinking. The importance of this factor was also mentioned by a great mind and an author of Theory of constraints (ТОС) Eliyahu M. Goldratt: «Educated youth strives not for stability but for a purposeful life» (To live a full and meaningful life. The Choice: Eliyahu M. Goldratt). Another factor is professional education and competence broadening. This method of valuable worker management is applicable to Ukraine, although it is rarely used and implemented in big international companies. By this means the companies equalize their labor over a short period of time, while the young workers increase their value on the global labor market. The importance of professional development is approved by the popular nowadays Flow Theory, elaborated by professor Mihaly Csikszentmihalyi (Flow: The Psychology of Optimal Experience by Mihaly Csikszentmihalyi). 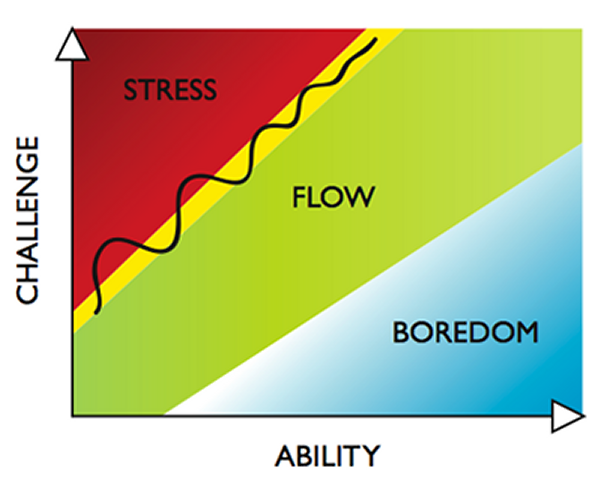 A picture from his book (depiction of the flow state) draws the attention of managers to what they very frequently forget about. Throughout our life, we can get into situations, when our experience and competences fall behind the complexity of problems, which we have to solve under professional profiles. This causes fear and stress, which exhaust people and make them change working place. At the same time, there are frequent cases when company managers and owners do not know how to “update” company strategy. In these situations, some employees are overly competent for the tasks given. Due to this, they feel bored and tired, it feels like wasting time. Thus, losing of qualified stuff is reasonable here. The best-case scenario for managers would be to ensure equal development of their employees and complicate the tasks set for them. This gives a chance to hold the most valuable youth for longer. Finally, the third factor by Glucksberg is independence. It means wherever you do your work (at home or office), its appreciation depends only on timely and quality performance. Application of independence principle helps to harmonize family life and balance it with work. The remote performance of tasks decreases the number of manager’s interference into their labor’s work, allowing to focus on one task. The leading Ukrainian companies are introducing flexible hours into their work. For example, employees of Ukrsibbank BNP Paribas have several options when to start their working day (8.00, 9.00 or 10.00) and, respectively, have the ability to leave earlier. Besides this, once a month employees are allowed to work remotely. Consequently, we can conclude that keeping of promising youth in Ukraine depends not only on macroeconomic and political circumstance but also on the professionalism of managers. In order to boost quality and development of businesses some additional characteristics as analytical and critical thinking, creative approach to problem-solving, continuous training, communication and emotional management, development of personality and closest circle of people. Combining abilities to think strategically, set priorities and effectively manage time, solve complex problems and achieve successful results, one will definitely become an irreplaceable and highly paid employee or high-flying business owner. Investment of money and time into your talented employees may really result in loss of qualified labor, but if you do not invest, you will always work with unskilled staff only.